Return to Macs Only! 's Front Page. Copyright 2009 by Bill Fox All rights reserved. Abstract: The 128GB RunCore SSD makes my 1.6GHz MacBook Air run super fast for disk-intensive tasks. For $470 including shipping, you get SSD performance, an additional 45GB of internal storage and an 80GB external USB drive that doesn't need an A/C adapter. Nearly two years ago I was seduced by Apple's very slim, three pound MacBook Air (see my review). I bought the 1.6GHz Core 2 Duo base model with an 80GB hard drive because I suspected there was only an imperceptible speed difference with the 1.8GHz CPU, a $200 upgrade, and the rather smallish 64GB solid state drive (SSD) upgrade cost nearly $1000 all by itself. At the time, the mini 1.8" 80GB 4200RPM hard drive seemed large enough for my stripped down traveling Mac (I use a Mac Pro when not traveling) and it seemed fast enough for standard uses from my try-outs at an Apple Store. However, I knew that eventually I would need more space and would crave faster performance. I expected that the size of SSD's would grow rapidly and their cost would plummet enough to save the day when the need for a new drive arrived. Unfortunately, my plan was foiled by Apple's decision to use drives with the older PATA interface in the initial Air. The second generation Airs with a larger 120GB hard drive or a cheaper/larger 128GB SSD arrived with the newer and incompatible SATA hard drive interface--same for the Windows world. This virtually ended the manufacturing of 1.8" hard drives and SSDs using the PATA interface, making bigger and faster ones scarce and relatively expensive way sooner than I had expected. So, now I was resigned to getting either a new MacBook Air (a third generation Rev. C) or an aluminum unibody MacBook. I almost got the fabulous new 13" MacBook Pro this past summer but the expense and an additional pound and a half of weight (nearly 50% more than the Air) kept me procrastinating, that is, until I read Dan Frakes' 12/17 review of the RunCore Pro IV SSD in a new Rev. C 1.86GHz MacBook Air. The performance improvement was absolutely amazing. The upgraded Rev. C 1.86GHz Air was even faster than the Rev. C 2.13GHz top-end model with a stock SSD in drive-related tests. Woohoo! The RunCore Pro IV SSD comes with a PATA interface as well as a SATA and comes in sizes from 16GB to 128GB. However, the cost for the 128GB model is not insignificant at $460. I found it for as low as $419 from other online vendors, not that much of a bargain. Based on Frakes' test I could expect disk-based performance roughly equal to or maybe even better than a new Rev. C Air. The new Air still had the same 2GB of memory and 5-hr battery of my Rev. A Air, which I am very happy with except for hard disk space and disk-based performance, especially running Windows via Parallels. If I could put up with the extra 1.5lbs, I could get a 13" MacBook Pro with a 2.53GHz CPU, 4GB of memory and a 7-hr battery for just $1499 or a net of about $1200 after sales tax and selling my Air. But I had sprung for Apple Care on my Air and have 15 months left on it so I decided to pass up the new Pro and its 1.5lbs and to put $500 more into my Air for at least another year's use. Maybe by then Apple will have upgraded the Air with more memory, a longer battery life and a faster/larger SSD. A copy of Mike Bombich's excellent Carbon Copy Cloner was supposed to be on the SSD but it wasn't. Instead, once I got the USB case assembled with the SSD inside, a Windows .exe file for TrueCopy was on it. And even though the SSD was labeled for a Rev. A MacBook Air, it was formatted for a PC, i.e. Master Boot Record format instead of GUID Partition Table format. After installing the SSD in the Air, the old disk drive can be placed in the external USB drive case and used as an emergency boot drive and for additional external storage. The first step leaves out one of the tasks that I found to be the more difficult, i.e. assembling the external USB case and installing the SSD into it. The directions in the manual (in Chinese and English) show using the shorter ribbon cable, the one with the blue end, to connect the SSD to the USB board by inserting the blue end into the ZIF socket on the USB board. But it didn't fit because it was too thick. The blue end was also too thick to insert in the SSD's ZIF socket. Since the white end fit into both sockets, I used the longer ribbon cable with two white ends instead although it is not mentioned in the manual except on the parts list. I left the top off the case because I had a lot of difficulty with the tiny phillips screws and it wasn't necessary for just cloning the contents of the hard drive onto the SSD. Once together and plugged into the MacBook Air via the included mini USB cable, cloning the hard drive onto the SSD was simple. First, I had to reformat the SSD using Mac OS X's Disk Utility because it was formatted for a PC with the Master Boot Record partition scheme. I chose one partition and the Intel Mac's GUID Partition Table scheme. It doesn't matter what you name the SSD during formatting because it will get the same name as the internal hard drive in the next step. Then, I selected the Restore tab, the source as the MacBook Air's current hard drive and the destination as the SSD and clicked the Restore button. It took awhile to clone the drive. I then made sure the SSD worked to boot up the Air before the next step. The final step is to swap the internal hard drive for the SSD. The web site iFixit.com has an excellent set of instructions for doing this in a downloadable PDF file. (By the way, iFixit.com also sells a 120GB hard drive for a more reasonable $249 if you just want more capacity in your Rev. A MacBook Air.) I followed the iFixit instructions to remove the old 80GB hard drive and encountered no surprises or problems. I even used my fingernail in place of the plastic spudger, something I have done before, but I recommend that anyone trying this for the first time use a spudger because the ribbon cables are fragile. Re-assembly was a bit more challenging. When I first re-assembled it, the Air couldn't find the SSD to boot up so I had to re-open my Air. I discovered that the connector on the SSD's ribbon cable had popped loose from the logic board, probably when I had screwed down the bracket holding the SSD. Screwing down the bracket seems to put some tension on the ribbon cable so be aware of this possibility. However, I may have simply not snapped the connectors together completely the first time. Upon re-assembly the second time, the Air booted up fine off the SSD and I finished replacing all of the remaining bottom screws. The RunCore SSD's performance is amazing, testing faster by 45 to 3075 percent. While its performance is excellent in beating the HD by 45 to 141 percent in the sequential write and read tests with small and large files, the SSD's performance is relatively spectacular in the random tests, especially with small files. The RunCore SSD is faster than the 80GB hard drive in every test, ranging from 38 to 69 percent faster. I had been running certain Windows applications with Windows XP using Mac OS X 10.6.2 (Snow Leopard) Boot Camp 3.0 because they were too slow with Parallels Desktop 4 for Mac. Apple's Boot Camp is great but it is much slower to restart under Windows (72 sec), launch and run an application (e.g. 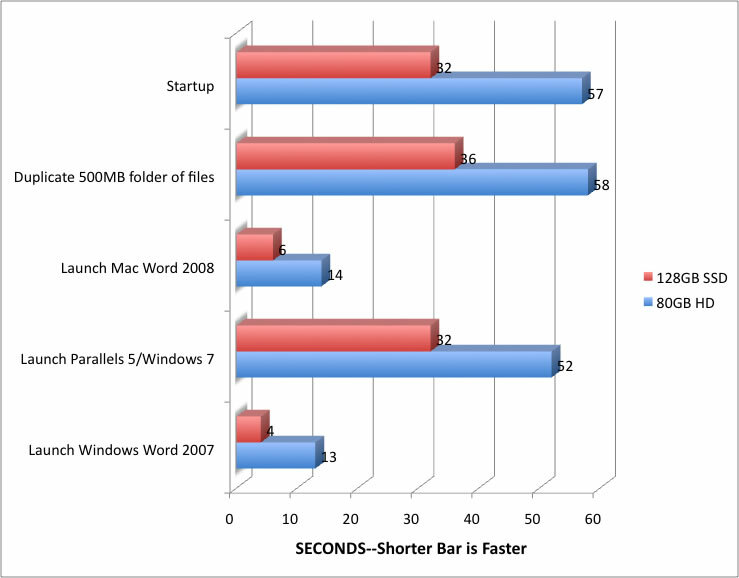 launching Word 2007 took 11 sec) and reboot back into Mac OS X (71 sec) than to launch and run Windows applications under Parallels. Running Windows applications in Windows 7 in Parallels Desktop 5 for Mac is very snappy using the RunCore SSD so it will save me from having to use Boot Camp. While the RunCore Pro IV SSD came with a few surprises, it is very fast. The SSD makes my original (Rev. A) 1.6GHz MacBook Air competitive in speed with the current (Rev. C) 2.13GHz model with a stock SSD for many standard operations. It is so fast that it allows me to use Parallels 5 with Windows 7 instead of Snow Leopard's Boot Camp, saving me quite a bit of time booting into and out of Boot Camp to run a Windows application. Also, I now have a small external 80GB USB drive to serve as an emergency boot drive and for additional storage. Besides its small size and weight, it does not need an AC adapter, a major plus. My only complaint is that the quality of the case is not very high. I had to find a small piece of plastic to wedge between the drive and the USB board to keep the board from sliding too far into the case when plugging an external USB cable into its mini USB port. My MacBook Air already gets great battery life, about 4 hours without WiFi, doing non-disk intensive activity and with the screen dimmed by 50% or more and around 3 hours with WiFi. I expect battery life to be a bit better with the SSD. Using my MacBook Air extensively for several days with and without WiFi enabled seems to confirm this although I have no real objective measure to report. 1. Unable to send Cox POP account email -- Changing the outgoing mail server port to custom and entering 25 in the port field worked for my Cox account and the problem has not occurred again. But it has not worked permanently for my Exchange account that developed the same problem after the 10.6.1 update--see next item. (Mail menu>Preferences>Accounts>Select the specific account>Outgoing Mail Server popup menu>Edit SMTP server list>Select the specific server>Advanced button>Click Use custom port button>Type '25' in field>Click the OK button). When I am again unable to send email via Exchange, I simply open Mail preferences and click the other radio button "Use default ports (25, 465, 587)"--back and forth, back and forth.... This is very annoying but at least it works and only happens only a couple of times a day. 3. Mail (or Keychain) keeps "forgetting" POP email accounts password -- Just before 10.6.1 came out I used Keychain First Aid (available from the drop down menu of the Keychain Access utility). It found and fixed several problems. Then, I updated to 10.6.1. Following those two actions, I have not had any further occurrences of this problem. I can't say which fixed it since the time between the two was so short. Using Keychain First Aid should be the first thing one does when encountering problems with applications "remembering" things stored in the Keychain. But Keychain First Aid does not always work as my spouse has been unable to get rid if this problem for her DotMac account since upgrading from Tiger to Leopard. I've tried Keychain First Aid, changing her DotMac password, deleting and remaking her Keychain and Mail preference files and even making a new user account. Next, I'm going to wipe her drive and install Snow Leopard and applications from scratch without importing any files from her current home directory. 4. Extraneous Draft email in the Drafts folder -- This is an Exchange problem and it is still occurring. It has two apparent causes. First a draft is automatically placed in the Drafts folder when typing an email takes more than a short time--this is normal. However, when the email is finally sent and copied to the Sent folder, Mail 4.1 (and 4.0 before it) frequently does not delete the draft from the Drafts folder--I have to do it manually. Unfortunately, this does not always happen so it will be a tough bug to figure out. Second, sometimes when I delete items in iCal that were placed there by Exchange from Outlook, they end up being copied to the Drafts folder. Again, this also happens intermittently so it will be a tough bug to find. 5. Strange font handling -- This is still a problem. Incoming messages still frequently display in a different font and point size than the font and point size that I have selected for messages in Mail's preferences. I have been using a rather large Verdana 16 to make some messages readable but changing the preferences back to Verdana 12 still results in tiny font that is barely readable in many incoming messages. Changing between Rich Text and Plain Text does not fix the problem. Most, if not all, of the remaining problems with Mail v4.1 that came with the Mac OS X 10.6.1 update are associated with my Microsoft Exchange account. I'm still happy for the most part with Apple's implementation of Exchange compatibility because I do not have to use Boot Camp or Parallels to get to Outlook in Windows all the time. The Apple Mail bugs are annoying time sinks but not as annoying as using Outlook in Windows. Apple Mail's much better readability in Mac OS X and Spotlight's more rapid, complete and accurate searches makes my work day much easier and more productive. Unfortunately, iCal is not a complete replacement for Outlook Calendar. I still have to use Outlook in Windows occasionally if I need to do certain things like replying with a message to an email meeting invitation or changing some of the data in a meeting set up by someone else. In addition, email meeting invitations from Outlook disappear when accepted or declined in Apple Mail taking with them valuable information for the meeting. Hopefully, these Outlook Calendar capabilities will be included in subsequent Snow Leopard updates. [9/11] Hands-On Review: Mac OS X 10.6.1--Speed increase? In my review of Mac OS X 10.6, I noted that the biggest disappointment of Snow Leopard was the reduced speed of the graphics drivers for the red hot (sadly with Windows only!) EVGA GeForce 285 GTX for the Mac. Apple released Mac OS X 10.6.1 yesterday with a newer graphics driver set (1.6.2 vs 1.6.0) so, of course, my hopes were raised that the performance of the GeForce 285 GTX would at least increase to the level achieved under Leopard 10.5.7. In almost all cases, the scores are still higher (red) under Leopard and some are significantly higher. There are no significant speed differences between Mac OS X 10.6.1 and 10.6. So far the only problems that I've had with Snow Leopard (SL), Mac OS X 10.6, is with its version of Apple Mail (4.0 Build 1075/1075.2). Most have been transitory but one was permanent and for that one I have a fix. - Unable to send POP account email. After installing Snow Leopard I was unable to send POP email via the outgoing (SMTP) email server for my Cox cable internet connection. This had never happened before and the Cox connection has been great about allowing me to send emails from all of my POP email accounts the via their server. Fortunately, this was easily fixed by setting a custom port as 25 rather than using the default. - Exchange account losing server. Several times my Microsoft Exchange email account would not send email and the server popup menu appeared on the message under the Subject field and to the right of the account field with the selection "None." Each time this happened I opened the preferences for the Exchange account and no Outgoing Mail Server was selected. I simply re-selected the Exchange server and everything was fine for awhile. - Mail (or Keychain) keeps "forgetting" POP email accounts password. The passwords to access my email accounts have been stored in Keychain for years. But for some reason, SL Mail has frequently kicked out messages requiring me to re-enter my password and click the box to store it in Keychain. It happens when Mail automatically checks for new mail. I remember this happening but very rarely previous to SL and only to one account at a time. Update 3: - Strange font handling. I noticed and several readers also wrote me that the font preference selections in SL's Apple Mail 4.0 do not work as expected. First, many emails are received with the font being very tiny regardless of what font is selected for messages in Mail 4.0's preferences. I have selected Verdana 16 for messages which makes these emails a barely readable size but which also makes my outgoing emails to have abnormally large fonts. Second, incoming emails frequently do not display in the preference-selected font regardless of my preferences selection. For example, if I send someone an email using Verdana 16 font and they respond, my outgoing email font appended to their response has changed from Verdana 16 to Tahoma 13 in the header and to New Times Roman 16 in the body. Curiously, my signature block shows as Verdana 16 as originally written and as selected in Mail 4.0 preferences. [8/31] Updated Hands-On Review: Mac OS X 10.6 Snow Leopard--How fast is it? The Fashion Valley Apple Store in San Diego was busy, but not more than is usual for a Friday afternoon, when I picked up a copy of Mac OS X 10.6, Snow Leopard, Apple's latest version. For those of you wondering, the build number is 10A432 which is the same as the last developer release in mid-August mentioned by several web sites and then rumored to be the so-called "Golden Master." My main reason for upgrading beyond just a penchant for keeping current is the promised compatibility with Microsoft Exchange Server 2007 for Mail and iCal. I have been using Parallels on my Mac Pro and Boot Camp on my MacBook Air to use Microsoft Outlook, a really poor application in my opinion, and to get around some proprietary Microsoft web coding in certain applications. Snow Leopard only runs on Intel-based Macs so it leaves behind my two PowerBook G4s, a 17" and 12", and two Power Mac G4 Cubes. The PowerBooks are running Mac OS X 10.4.11 (Tiger) as is the stock Cube but Leopard Server 10.5.8 is running on the Cube with an upgraded 1.4GHz CPU. Snow Leopard will go on my Mac Pro (early 2008), MacBook Air (early 2008) and white Intel-based iMac, all running Leopard 10.5.8. On my Mac Pro, the 10.6 installation took a very quick 24 minutes from the time I clicked "Install" to the reboot into 10.6. It was an automatic upgrade install since Apple has done away with selecting the type of install to do. Because I have a 60 percent empty 1TB hard drive, I used the "Customize" button to load almost everything on the install disc including all fonts, languages, X11, Rosetta and QuickTime 7. However, I left the printer drivers on the default option. The 10.6 installation on my MacBook Air took a little longer, about 31 minutes. But it also installed with no drama. I'm holding off for awhile on the iMac because my spouse uses it and wants me to make sure there are no instabilities in 10.6 like there were with the initial Leopard release. Boot Camp 3.0, unfortunately, is another story. It installed just fine on my Mac Pro, upgrading Boot Camp 2.1 and Windows XP SP3 to Boot Camp 3.0. However, because the Windows partition on my MacBook Air was nearly full and I was already having problems with CDs being recognized by the MacBook Air's special USB external optical drive in Windows XP SP3, I decided to remove the 11GB partition, make a new 22GB partition and reinstall Windows XP SP3, a 2+ hour process after also reinstalling the application software. [Update: Apple has posted a workaround (HT3841)--thanks Kevin Meiser!] I tried and failed to install the Windows XP Service Pack 3 (SP3) three times. The first two times the SP3 installer was unable to copy a file while backing up third party drivers, meaning Boot Camp 3.0. Ending the SP3 installation process gave an error message that SP3 had been partially installed and Windows XP may not work correctly. The third time I tried to install Boot Camp 2.0 from the Leopard CD because it had previously survived the SP3 upgrade but that caused Windows to crash and destroy the Windows partition. So, on the fourth attempt I left it at SP2. Maybe I can get an SP3 disc from Microsoft. If not, hopefully the Windows 7 upgrade, when available, will work on SP2 or better Apple will quickly post a fix. I put up with this grief because in some countries I have needed a real Windows installation to get on the internet. This took over 6 hours, including downloading and installing some 117 other updates and reinstalling Microsoft Office 2007. Mail and iCal sync beautifully with Microsoft Exchange Server 2007 on both Macs. All the applications I use frequently appear to work fine: Adobe Reader 9, Dreamweaver CS3, Photoshop Extended CS3 and Photoshop Elements 6; Apple iWork 9 and iLife 8; Microsoft Office 2008 and Skype. Unfortunately, two very handy Mail pluggins do not: Letterbox 0.22 and Widemail 0.5.1. Both pluggins that move the message viewer pane to the right of the mail list pane instead of under it, a shape that fits the screen much better, are disabled by Snow Leopard. The authors of both applications are working on a version for 10.6. Blue is slower by 10% or more. *Mostly 10.5.7. **Erratic results. Snow Leopard 10.6 tested slower than Leopard 10.5.7 in virtually all of the graphics benchmarks, some significantly slower. Also, the startup time was significantly slower. While the shutdown time appeared to be slightly faster, the result were erratic with an occasional very long shutdown time. [Update] With regard to performance, Lloyd Chambers posted some benchmarks using photography applications that show some marginal speed gains of Snow Leopard over Leopard, especially using the 64-bit kernel. However, he did not post which graphics card he used in obtaining the benchmarks. Well, the good news is that I got Snow Leopard primarily because of its advertised compatibility with Microsoft Exchange Server 2007 and it did not disappoint me in that department. So far the compatibility is seamless. This will save me from having to work long hours with Microsoft Outlook. In addition, none of my principal applications seem to have any problems with Snow Leopard, a real plus. But the disappointments are not inconsequential. There are newer Nvidia drivers in 10.6 for the superb EVGA GeForce 285 GTX graphics card in 10.6 so I was hoping that the new drivers would speed up the card's slow performance in Mac OS X but I was disappointed. Snow Leopard is slower than Leopard in the graphics tests, some very significantly so. On Tuesday afternoon, Apple released its third quarter (Q3) financial report for fiscal year 2009 ending June 30th. For the second quarter in a row, Apple set a record for non-holiday quarterly revenue and earnings. Revenues were over $8.3 billion, net quarterly profit was $1.23 billion and earnings were $1.35 per diluted share. Gross margins were a remarkable 36.3% and cash on hand increased to $29 billion. In posting this super performance, especially in a continuing down economy, Apple beat the analysts consensus estimated earnings per share by over 15%--see chart at right. Mac sales of over 2.6 million were up 4% from Q3 of 2008 and iPod sales of over 10 million and iPhone sales of 5.2 million were down 7% and up a huge 626% respectively. Among the Macs, desktops (iMacs, Mac Pros and Mac minis) were down 10% and portables (MacBooks, MacBook Airs and MacBook Pros) were up 13% as compared with Q3 of 2008. Clearly, Apple's record Q3 in 2009 was due to once again to tremendous iPhone 3GS sales and good portable sales. Sales revenues in the three big regions were up in 2009 Q3; Americas by 11%, Europe by 22% and Japan by 14% over 2008 Q3. Retail store sales were up a modest 4% over 2008 but still about half of the sales were to people new to the Mac. The Macs Only! web site is for informational purposes only. No one associated with Macs Only! assumes any responsibility for its accuracy. The information is subject to change without notice. Any use of, or actions taken based upon any of the information contained on this web site is done entirely at your own risk. Mention of any products or services is for informational purposes only and constitutes neither an endorsement nor a recommendation. Macs Only! and those associated with Macs Only! assume no responsibility with regard to the selection, performance or use of these products. Apple, Apple Logos, Macintosh, and Mac OS Logos are registered trademarks of Apple Computer, Inc. All other trademarks mentioned belong to their respective owners.